It was never bipolar disorder; it was just gluten. Just what is a mental illness anyway? Mid-19th century: from Greek psukhōsis ‘animation’, from psukhoō ‘I give life to’, from psukhē ‘soul, mind’. A severe mental disorder in which thought and emotions are so impaired that contact is lost with external reality. Today my GP finally REMOVED my diagnosis of bipolar disorder type 1 from my list of diagnoses. With just one click she erased a label that had been a huge and distressing part of my recent past. Losing a psychiatric diagnosis is very unusual as they are usually just ‘upgraded’ to something else such as schizophrenia, which was looking increasingly likely in my case. She replaced it with ‘gluten intolerant’ as gluten ataxia and gluten psychosis aren’t yet recognised by the NHS. It doesn’t adequately explain what happens when I eat gluten, but I’ll take it over the bipolar label any day! This came as something of a surprise to me, not the fact that gluten was a cause of my mental illness, but that my GP was prepared to remove the diagnosis from my records. Of course, my medical history still exists, and I certainly had met the criteria to be labelled with bipolar 1, but the fact that a GP was prepared to do the unthinkable and remove a label that is considered a Serious Mental Illness (SMI) was a surprise. I’ve been challenged already about this. ‘It was never bipolar’, ‘you were misdiagnosed’, ‘you still have bipolar but it’s just in remission’ are just a few comments made in some less enlightened internet groups, however I did have Bipolar 1 with paranoid psychosis. I have the medical notes to prove it. My records even show that I even had various ICD10 codes assigned which include most of the F30 and F31 codes. This change of diagnosis has got me thinking about what mental illness is, and why losing a label of any SMI is almost unheard of. As far as I can tell, psychiatry has built an entire infrastructure around the definition of ‘normal’, and normal is the result of a shared belief system where some behaviours are acceptable, and others are not. Conforming to these expectations, sometimes through force and medication, has become an essential part to reinforcing what is considered normal. Those who are not performing their expected part in the machinery of this system are deemed less or non-functional (the quantification of which, psychiatry assigns a numerical value based on the Global Assessment of Functioning metric scale). If we look at a purely evolutionary position, we are, as Alan Watts says, flesh robots on a dead rock, spinning out in the middle of nowhere. We are just a component part of a bigger ecological system, and when we forget our place some of us, the ‘canaries in a coal mine’ as Dr Kelly Brogan calls them, present with personality changes that differ from the acceptable face of normal. To understand how ‘normal’ has become the driving force behind the explosion of the powerful lobby that is psychiatry it helps to take a quick look at its history. In the 1950’s and 60’s the first generation of antipsychotics was introduced that had a profound effect on severely unwell and institutionalised psychotic patients. It was followed in the 1970’s by the mood stabiliser lithium and state mental hospitals and asylums rapidly emptied as patients were reintroduced to the machinery of our society as they began to appear more normal once these medications were administered. In 1980 the Diagnostic and Statistical Manual (DSM) of Mental Disorders was radically revised and removed all psychoanalytic language and referred to mental illnesses without any reference to aetiology. Patients were thereafter diagnosed by "meeting criteria" for one or more defined disorders. One result of this shift was that psychoanalysis and psychodynamic therapies were increasingly seen as nonspecific and unscientific, whereas pharmaceutical research took off in search of drugs that could improve discrete symptoms to the point that patients would no longer meet criteria for a DSM-III disorder. What followed was an explosion of psychoactive medication. Anti-depressants such as Prozac, and second generation ‘atypical’ antipsychotics such as Risperidal and Zyprexa (a drug of which I am sadly all too familiar) became the go to solution for anyone who presented with a change in personality that broke with the acceptable norm that impaired their relationships and work. Psychiatry was increasingly seen as a mainstream medical specialty and public research money strongly shifted toward pharmaceutical research. However pharmaceutical innovation dried up in the 2000s; no new classes of medication or blockbuster psychiatric drugs were discovered. Moreover, previously unrecognized or under-appreciated side-effects of widely used medications hit the headlines. SSRIs were implicated in increased suicidal behaviour, and some patients reported severe "discontinuation syndromes" when stopping treatment. Atypical neuroleptics were associated with a "metabolic syndrome" of weight gain, increased diabetes risk, and other medical complications. Adding insult to injury, the millions spent on basic brain research led to no advancement in the understanding of psychiatric aetiology or other types of treatment. In 2013 the release of the DSM-5 was criticised for further shrinking what was considered normal. The bastion of psychiatry has gained an almost impenetrable foothold within the mechanism of modern medicine. Speak with anyone who works in mental health, particularly nurses, and it’s almost a taboo to challenge the model of treatment to which they have subscribed. Offering alternative therapies such as following a strict nutrient dense, gluten free lifestyle is forbidden. ‘People might stop their meds’ and ‘someone might die’ are frequent arguments why I need to keep my mouth shut. And I get it, there were times long before I knew of my real diagnosis where stopping medication might have been a risk too great to take. But then again if I hadn’t stopped, I may well have died by now anyway. Challenging the conventional allopathic treatment model with anything other than first line medication is still unthinkable, but I will continue to tell my story and encourage others to challenge their doctors regarding their treatment. I am not going to advocate that anyone just stop their meds and try and gluten free diet, because if it’s not gluten then the risk is still too great. What I hope to achieve is to get the current medical establishment to look beyond the DSM and try to find out why certain people react with abrupt changes to their personalities when something in their environment is ‘off’. Finding that trigger and making suitable adjustments is surely a preferable form of treatment, even if it erodes the pockets of the pharmaceutical companies in the process. I was diagnosed with low vitamin B12 by my endocrinologist in 2012. Incredibly my psychiatrist chose to ignore his advice that I be prescribed cyanocobalamin injections and I continued to suffer the serious neurological effects of this deficiency for a further 4 years. 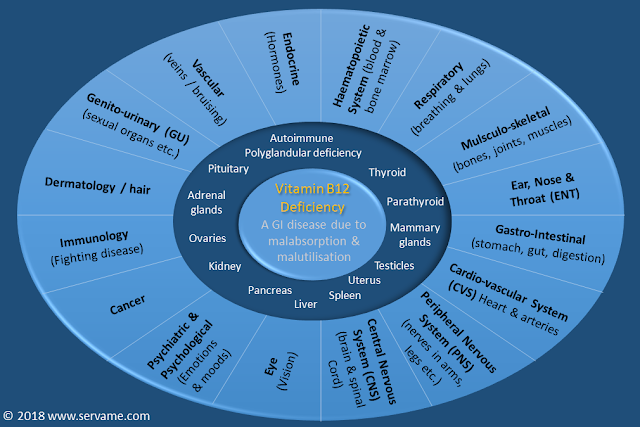 A vitamin B12 deficiency may cause a wide-ranging variety of symptoms and affect multiple organs and systems as shown below. What is vitamin B12? Vitamin B12 is a water-soluble vitamin that your body needs for essential functions such as DNA synthesis, carbohydrate metabolism for energy, red blood cell production, and cellular and tissue repair. Your body uses what it needs of most water-soluble vitamins and excretes the rest in urine. B12, however, is different because your body can store it in the liver for up to five years. A B12 deficiency is rare in healthy people, but can occur in people who suffer from disorders such as coeliac disease and atrophic gastritis. 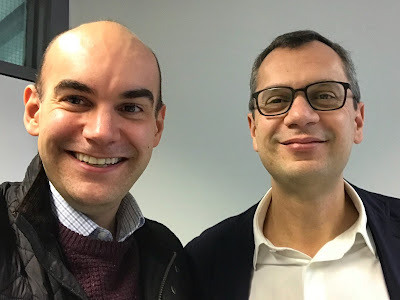 Yesterday, 13 Feb 2018, I had a consultation with Professor Hadjivassiliou. For those of you who aren’t familiar with his work he is the world-leading expert in the neurological effects of gluten and is behind the discovery that it’s possible to have an autoimmune reaction to the gliadin in gluten and not have celiac disease, a condition known as non-celiac gluten sensitivity (NCGS). My Brain Health Protocol Infographic - the process I followed to get well. I am pleased to present my latest infographic. A single, easy to follow reference the describes the process I followed to treat the underlying autoimmune encephalitis that caused my psychotic illness. 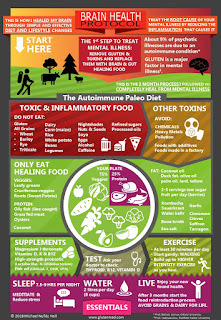 I have called the process The Brain Health Protocol and it follows the autoimmune paleo diet and lists the other lifestyle changes I adopted to heal.